40 Questions on Bond… Bond Music, Bond Cars and Bond Girls to follow. The Picture Round is on those wicked Bond Villains and the Wild Card is a Bond statistic we’re still working on! Here’s four samples from the 40 (plus bonus) questions included in the download. The samples are from each of the four themed rounds, General Bond Knowledge, Bond Music, Bond Cars and Bond Girls. The download contains 1 x PDF with the answers under each question, 1 x PDF without the answers (if you fancy playing yourself!) and a text version so you can copy and paste into your own Quiz format. Q04. 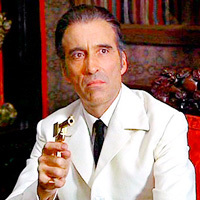 Who was the second actor to play James Bond?? Q18. Which Bond film did Nancy Sinatra sing the theme tune to? Q23. In The Spy Who Loved Me what unique adaptation did Bond’s white Lotus Esprit have? Q37. In the 1969 film On Her Majesty’s Secret Service who played Bond’s bride Tracy Di Vicenzo? 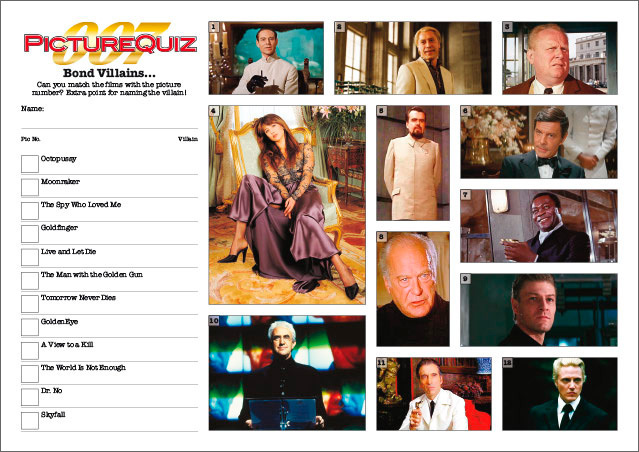 The Picture Round in this themed Quiz is the evil villains who Bond encounters. The film title is given but can you name the villain? The Wild Card for this themed special will be a crazy statistic to do with the Bond films.